How do we answer this urgent call of the soul? Whether we identify as Christian, Hindu, Muslim, Jew, Buddhist – or none of these – how can divine love become the living truth and core of our being, rather than mere flowery rhetoric or theological ideal? In these precarious times of growing conflict between religious traditions, it has never been more important for lovers of the Divine from diverse traditions to gather together – to listen, to learn, and to deepen together in shared contemplative silence, conversation, prayer, and celebration. The premise of this conference is that where two or more spiritual traditions are gathered, there shall God be also. Program sessions include silent contemplative practice and prayers, inspiring presentations, interactive groups, breakout sessions with presenters, and chanting & dance and other celebrations. “On this path, each stage is attained only by becoming that stage oneself,” says Jnaneswar. Join us to explore the path of divine love in your life, and find the support to walk this path in your unique way, whether or not you belong to a recognized faith tradition. Ravi Ravindra is a spiritual visionary and leading interfaith scholar of religion, science, and spirituality. He is author of fourteen books including: The Yoga of the Christ, republished as The Gospel of John in the Light of Indian Mysticism and Pilgrim Beyond Boundaries and The Wisdom of Patanjali’s Yoga Sutras. A student of J. Krishnamurti and G. Gurdjieff, Ravi is Professor Emeritus of physics and comparative religion at Dalhousie University in Nova Scotia. He is author of Science and the Sacred and other books on science and spirituality. Ravi teaches across the globe on the world’s spiritual traditions, yoga, and science. Mirabai Starr is author of ten books including critically acclaimed translations of the timeless Christian mystical classics, Dark Night of the Soul by St. John of the Cross and The Interior Castle by St. Teresa of Avila. Mirabai has edited six books of writings and prayers from other Christian icons including St. Francis of Assisi and Hildegard of Bingen. She is professor of Philosophy and World Religions at the University of New Mexico-Taos, and is a certified bereavement counselor. Her forthcoming book, God of Love, focuses on the path of love in the three Abrahamic traditions. Jamal Rahman is a Muslim Sufi minister, co-founder of the Interfaith Community Church in Seattle, and adjunct faculty at Seattle University. He is author of Fragrance of Faith: The Enlightened Heart of Islam, and co-author of Getting to the Heart of Interfaith and Out of Darkness, Into Light. He travels nationally and internationally with a Rabbi and Christian pastor in a unique emerging ministry-affectionately known as the three “Interfaith Amigos”-spreading a message of inclusive spirituality. 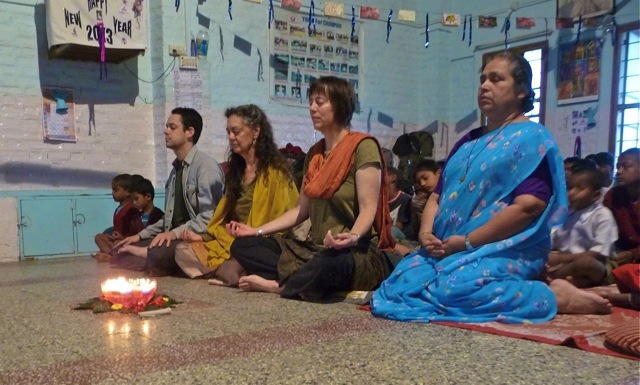 Swami Ambikananda Saraswati is a Hindu sannyasa, and founder of the Traditional Yoga Association in the UK and the MUKTI project for dispossessed children in India. Raising her children in England and India, she was a disciple of Swami Venkatesananda, and was initiated by Swami Chidananda Maharaj, the “sage of the Himalyas.” She is the spiritual leader of the Hindu Temple in Reading, UK, and author of Healing Yoga and translator of the Katha Upanishad and Uddhava Gita. Sister Lucy Kurien is a Catholic nun who founded the Maher interfaith refuge in 1997 for battered and destitute women in India. Maher honors all religions and repudiates the caste system, and has saved and rehabilitated the lives of 1,550 Indian women. Sr. Kurien’s work is featured in the book Women Healing Women by William Keepin and Cynthia Brix. are directors of the Satyana Institute and founders of its Power of Reconciliation International project, which has convened gatherings in six countries for healing and reconciliation between women and men. They are authors of Divine Duality: the Power of Reconciliation between Women and Men and Women Healing Women: A Model of Hope for Oppressed Women Everywhere. Will is an environmental scientist and spiritual retreat leader, and co-author of Song of the Earth: The Emerging Synthesis of Spiritual and Scientific Worldviews. Cynthia is an interfaith minister and spiritual director, and co-founder of the Women’s Spiritual Mastery project which produced a DVD entitled Cultivating Women’s Spiritual Mastery.